azucarera, MEng bete, Eng swiss chard, garden beets, stock beets, or mangel-wurzels, and sugar beets are all varieties of Beta vulgaris or rapa. For Swiss chard see acelga. It has been claimed that the white beet originated in the Mediterranean and was brought to northern Europe by the Arabs and known in Saxon England by 1000. It was used as a garden vegetable and for fodder in England and Spain until 19th C when the first sugar factory began as the method of extracting the sugar had been discovered in the 18th C.
Beet roots were not used until Roman times but later forgotten. There are a few 14th C English recipes mentioning the leaves used in salads with dandilions and parsley or boiled in broth with other greens. As beets grow better in cool climates they do not appear in the Spanish manuscripts. In medieval times, the roots were not eaten but used in medicine. The juice from leaves and roots were used to purge the head and soften the stomach, which stopped the production of bad humors, i.e. they relieved constipation. They were thought to help the 'sifting' of blood in the liver, which favors sweet foods as honey. 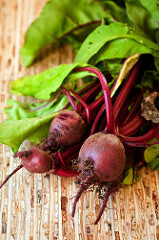 Beets were thought to have helped digestion in the liver. They were said to have relieved wounds and cured dandruff. Today beets are used to treat liver problems and some cancers.